In the spring of 1940 Norway fell under the Nazi jack­boot in a cam­paign that lasted 62 days and cost 5,000 lives on both sides. 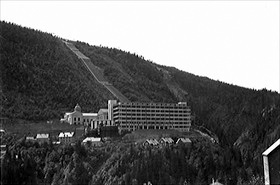 Three and a half years later, on this date in 1943, a mas­sive day­light bombing raid by 143 U.S. Army Air Forces B‑17s caused ex­ten­sive damage to Norway’s Ger­man-controlled Norsk Hydro’s plant near Rjukan in Tele­mark County. The fortress-like electro­chemi­cal and hydro­electric plant was im­por­tant to the Ger­man nuclear energy project, which needed heavy water (deu­te­rium oxide) to pro­duce nuclear wea­pons. (Along with graphite, heavy water was and is a prime can­di­date for mod­er­ating the energy of neut­rons so that it can sus­tain a nuclear reac­tion, or nu­cle­ar fis­sion.) Earlier in Febru­ary the plant had been sabo­taged by a team of Brit­ish Special Opera­tions Execu­tive (SOE)-trained Nor­we­gian com­man­dos in an opera­tion code­named Oper­a­tion Gun­ner­side that turned out to be the most suc­cess­ful act of sabo­tage in World War II. The entire in­ven­tory of heavy water pro­duced during the Ger­man occu­pa­tion, over 500 kilo­grams, was de­stroyed along with some criti­cal piping and tubes. By April, how­ever, the plant was again pro­ducing heavy water and attracting the atten­tion of the U.S. Army Air Forces. The sever­ity of the Novem­ber 16 bombing raid and the likeli­hood of further air raids con­vinced the Ger­mans to aban­don the Norsk Hydro plant and move the remaining stocks and cri­ti­cal com­po­nents to Ger­many. A Nor­we­gian sabo­teur thought other­wise. On Febru­ary 20, 1944, Brook­lyn-born Knut Hau­kelid, using 19 lb of plas­tic ex­plo­sive, sank the rail­way trans­port ferry on Lake Tinn (Tinnsjå) and with it pretty much all of Ger­many’s nuclear wea­pons research. A largely fic­tional Holly­wood account of the sabo­tage, The Heroes of Tele­mark (1965), starred Richard Harris as Knut Hau­kelid. Even before the sinking, the num­ber of Ger­man scientists working on applied nuclear fis­sion had begun to shrink, with many applying their talents to more pressing war­time demands, while some were drafted into the Wehr­macht to serve (and die) on the East­ern and West­ern fronts. At the end of the war, the Allied powers com­peted to ob­tain sur­viving com­po­nents of the Ger­man nuclear indus­try (person­nel, facili­ties, and materiel), as they did with the V‑2 rocket program. 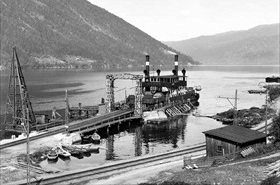 Left: Norsk Hydro’s Vemork Hydroelectric Plant at Rjukan, Nor­way, in 1935. At Rjukan a large water­fall was har­nessed to pro­duce chemi­cals related to the pro­duc­tion of artifi­cial ferti­lizer, including am­monia, potas­sium nitrate, heavy water (deu­terium), and hydro­gen. In 1925 the plant part­nered with the Ger­man com­pany IG Farben and later with Britain’s Im­perial Chemi­cal Indus­tries (ICI). Starting in Decem­ber 1934, the Rjukan plant was the only loca­tion in Europe that mass-pro­duced high con­cen­tra­tions of heavy water by means of elec­trol­y­sis in the Hydro­gen Pro­duc­tion Plant shown in the fore­ground of this photo­graph. The heavy water plant was closed in 1971. Today the origi­nal power plant is an indus­trial museum. One of its exhibi­tions covers the five heavy-water sabo­tage opera­tions conducted between 1942 and 1944. Right: The twin-stack steam-powered railway ferry SF Hydro operated on Lake Tinn (Tinnsjå, Tinnsjø). The 19‑mile‑long ferry trip made it pos­sible for Norsk Hydro to trans­port its chemi­cals from the plant at Rjukan to the coastal port at Skien. On Febru­ary 20, 1944, the ship was blown up by the Nor­we­gian resis­tance move­ment at Lake Tinn’s deepest point (1,411 ft) with a load of heavy water on­board headed for Nazi Ger­many for use in that country’s nuclear weapons program. After the war it was discovered that the Ger­mans were not as close to making an atomic bomb as the Allies had ini­tially feared. The wreck of the ferry was discovered in 1993.